We have to point out to our readers that while we are highlighting three outstanding teachers, based on our set of guidelines this year, several other teachers’ works are also worth celebrating for all that they do for the students. So that is precisely what we plan to do in coming issues of EP magazine later this year. 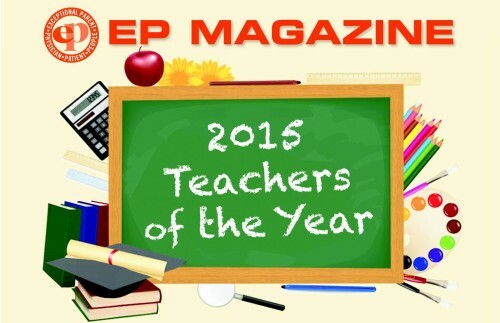 For now, let us celebrate the exemplary work of these three wonderful EP Teachers of the Year. Lead Instructor for Ai Academy, believes that the role of a teacher is that of a guide, presenting information in multiple ways that allow for consideration, exploration and maximum student understanding. In her position as Lead Instructor of Ai Academy—a program she created with the Executive Director of Shepherds College to offer specialized training to her students with intellectual disabilities with the greatest challenges—Erin presents information through step-by-step direct instruction, then guides each student as they learn through practice, trial and error. While this means her students have a bit more influence on the direction of the class, flexibility in their learning, freedom to fail, and the ability to succeed, it also means that Erin controls the environment in which the students learn. Erin is relentless in finding ways to address her students’ learning preferences and overcome their learning challenges. In her drive to help each student learn and grow, she developed tools based on her observation of each student, such as money board, a budgeting system. She even wrote her own curriculum. Erin is motivated to bring out the strengths in each student, and to encourage greater independence in each of their lives. She sets aside time to practice chores, helps them seek out accommodating resources, such as picture cookbooks and color-coded measuring tools to grow in cooking skills, and these days, she is implementing MyPlate to aid in making healthy food choices. One of her most helpful classroom developments has been the creation of a student-run café that sells beverages and food items during the week, to staff and other students. This fun initiative allows the students to work with money, demonstrate leadership, practice cooking, serve others, encourage professionalism, and prepare them for volunteer work in the community. Erin truly loves her students and it shows in her patient and passionate teaching. As a result of her investment in their lives, Erin’s students accomplish great things and enjoy more fulfilling lives. I pursed my degree in Special and Elementary Education as an avenue to work hands-on with individuals with special needs. I wanted to teach in a way that influenced the lives of my students in practical ways. Teaching at Shepherds College has allowed me to work in an innovative environment that encourages Appropriate Independence™ (Ai) amongst its students. classroom management for Ai Academy. While seeing the development of Ai Academy go from concept to reality has been exciting, the real blessing has been getting to work with my particular students. When asked to write about what I love most about teaching my students, my initial reaction was, “my students are the best part.” Currently, students range in age from 19 to 27 and have developmental or intellectual disabilities. Despite their challenges, my students maintain a positive attitude and enthusiastically greet me in the morning with, “Good morning, Mrs. Luchterhand!” To expound on why my students are the best part of my job, I’ve determined four reasons, although I am sure there are more. First, my students have a gift of getting excited about what we are learning. Because of their learning and academic challenges, I am tasked with finding creative and involved ways of teaching. If I am enthused about what is being taught, then the students willingly get enthused and better understand the importance of what they are learning. Their enthusiasm makes teaching them fun! Second, because I am both their teacher and advisor, I am able to develop relationships with my students that go beyond the classroom. I have relationships with families and communicate regularly with parents. Because of this relationship, my students respond better to both correction and praise. I am able to know my students individually and can better understand their behavior and learning style. I am able to use this relationship to encourage growth, even when challenging. Third, because I have a relationship with each of my students, I am able to see their growth over the course of time. Shepherds College students work hard to develop their independence, and it is exciting to see them learn and apply class content to their lives. Because we learn social, daily living, and money skills, it is exciting to see them use these skills in their lives outside of the classroom. And last, my favorite part of teaching my students is seeing them learn about their own disability, understanding things they are good at and things in which they need support. This allows my students to develop both confidence and self-advocacy. The Bible teaches that God only gives good gifts. It is exciting to see the students learn that God has created and developed them just as He wanted. It is motivating for them to understand that they were created on and for a purpose, one of the principles of Appropriate Independence that we teach. While I love many things about what and where I teach, it is the students I love most. I am blessed to have relationships with each student and the support of families and co-workers. Mary Beth Brooke is a creative and resourceful teacher in the field of Special Education. The programs that she has developed for her students have helped to increase their independence and foster a great sense of accomplishment. For example, many believed that her students would never write. Mary Beth has been instrumental in teaching her students how to write their names, utilizing a program called “Writing without Tears.” She taught them how to sign their names on their checks, therefore fostering a sense of independence for them. Mary Beth has tailored a Work-Based Learning Program for her students that helps promote independence after high school. Currently, Mary Beth’s students benefit from job placements at: Orange Grove Recycling Center, Applebee’s, and Community Kitchen. Each of these jobs provides Mary Beth’s students the ability to increase their independence, while learning valuable job skills. Mary Beth maximizes her student learning potential by teaching them the fundamentals of working. Once her students receive a paycheck, she takes them to the bank, where she has taught them to stand in line to cash their checks independently. My nomination for the Teacher of the Year goes to Mary Beth Brooke, for fostering independence in her students. Mary Beth Brooke has B.S. degree in Elementary Education and a M.Ed. degree in Special Education. In addition, she has certification as a Work-Based Learning Coordinator, so that she can provide facility based and community-based job training experiences for her students. She is also a certified CPI (Crisis Prevention Intervention) Instructor for Orange Grove. She also works as a “sub” in Orange Grove’s Supported Living homes. I never wanted to be a teacher. I started out majoring in music, but soon found myself gravitating to the projects the education majors were involved in, rather than the long, isolated hours I had to spend practicing. I soon switched my major to education. Several years later, I retired as a middle school teacher, to devote myself to raising children. Once my children were in elementary school, I started substituting at their school. It was around that time that I became aware of increasing discussions about students with learning challenges. They were the students who did not learn by conventional methods, but who needed something “extra” in order to process and learn new information. In the classroom, I discovered that I was drawn to these struggling students, and in seeking ways to help their classroom environments become learning experiences. The thrill I got when I saw these students stay on task, behave, and actually learn, surprised me. I learned from them, and their enthusiasm excited me. And these experiences eventually routed me to back to school to pursue a degree in special education. When my first child entered high school, I entered the special education classroom and my students over the years have continued teaching me how to teach them. They have taught me the invaluable lesson that an effective teacher-student relationship is not a relationship in which each individual exclusively assumes one role or the other. I have learned from them that an effective teacher-student relationship evolves when each individual teaches the other, and they subsequently learn from each other. There are four critical lessons that my students have taught me so that I can teach them. First, they want a meaningful school day. A day that is planned just for them – a day where they are taught to develop their strengths in spite of their deficits, that they are a part of something bigger than themselves and that with the appropriate support, they can make a valuable contribution to their classroom, their family, their community and society at large. Secondly, they have taught me that they need to experience success. If the work is too hard, they wont try. If it’s too easy, it is pointless. I have never forgotten an article I read while I was in graduate school. It stated, “Students in special education, by the time they reach high school, have experienced a pattern of failure and defeat.” I determined at that moment, that if I ever worked with students with special needs, I would endeavor to create experiences for them where they could achieve success. Daily. Third, my students have taught me that they need opportunities. With the support and encouragement to explore their community, try new jobs, develop a new skill, try new foods, meet new people, etc. Learning occurs and new directions and possibilities often emerge. But the opportunities must be presented. Fourth, I have learned that my students want their learning environment to be engaging. They want activities that are fun and stimulating. And, they want staff to interact with them, to be present and in the moment with them, to connect to them. When I provide my students with the learning environment they have taught me they need, then the door is open to teach them. When the union of teacher and student becomes one of mutual teaching and mutual learning, being a special educator becomes more than a job. The individuals become co-teachers and co-learners. And that is a rich and rewarding relationship. Cheryl O’Brien has been an integral part of the Heartspring School for nearly 40 years. During her time at Heartspring, Cheryl has worked in several areas, including a preschool, physical education department, oral muscular therapy program and summer camp. As an involved member of the direct care staff, Cheryl has dedicated much of her life’s work to serving children of all abilities. Through her passion, in 2003, Cheryl built an entire program from scratch, contacting local businesses to help start a volunteer-based workshop program to emulate similar programs her students would transition to after Heartspring. Through the Heartspring School Workshop Training program, students work for real companies that provide tasks such as putting together packets, labeling envelopes, or sorting and assembling materials. Consequently, they are earning transferrable skills that they can continually use throughout their lives and as they transition into an adult workshop setting or other employment opportunities in their home districts. Cheryl’s commitment shines outside of her program. Heartspring students become her family, and she is always the first one to volunteer to be a part of their transition teams, traveling back to their home states to work with program facilitator to ensure that their programs are implemented correctly, and the students have the best chance of success. If there are more people out there like Cheryl O’Brien advocating for children with special needs, then there is a promising future ahead. It is truly an honor to belong to an organization that demonstrates commitment to the needs of our students, parents, school districts, staff and the community. I am privileged to have the opportunity to experience life-changing miracles each day. The hard work and dedication of our students, staff and families have kept me coming back for nearly 40 years. The students have taught me so many valuable life lessons about others and myself; they continually challenge me to grow and learn new ways to address their needs. Each individual is so unique, and I’ve been lucky enough to help each student forge his or her own path through the opportunities presented through the Heartspring Workshop program. It’s very rewarding to know that the skills they are gaining in the Workshop will take them to new heights upon returning to their home state when they transition out of Heartspring.